A couple of young guys, Eddie and Mitch, move to a small, run-down apartment in San Francisco after they finish college. They are kept awake at night by the two old drunks next door, a gay man and a homophobic man, who shout obscenities at each other until all hours. At first, fearing their safety, they begin to record these interactions, but eventually it becomes amusing to them. They start giving copies of the tape to friends and over time, it becomes a cult classic. 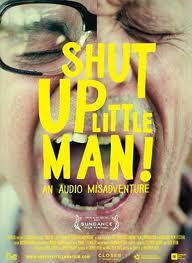 The ‘Shut Up, Little Man’ recordings, which spawned many cartoons, songs and other artwork. This documentary sees South Australian film maker Matthew Bate travel to San Francisco and take the young men, now adults with families of their own, back to the apartment to retell the events that transpired from these recordings. Debates that the film raised is whether or not these old drunken men were taken advantage of, and who has the rights to the material that was recorded – those who spoke the words, those who recorded them, or is it open to all? The film was too long, and seemed to spend a lot of time looking at areas that could have been covered far more concisely. An example of this was the debate over who was going to make the film of these two old men that really didn’t hold my attention. Plus, there were a lot of repetitive images that I found annoying – a microphone outside a window, or the same photos of the young men at the time of the recordings.